Working with texts and placing them within a theological framework. Saying “I love you!” to a crowd does not make any individual feel loved. Most assume it is meant more for others in the group rather than for ourselves, or it would be if the speaker really knew us well, even if the speaker is presumably the Holy Spirit. So even in a church where we regularly hear “God loves you no matter what!” it can be isolating to deal with mental illness, pregnancy loss, adoption/foster care, cross-cultural relationships, care-giving, addiction, discrimination or other big challenges. It gets worse when there’s bad theology intertwined in church people’s well-intended support. Preaching that gets specific, with solid theology about the issues that shape our lives, is the best kind of “life application” we can offer. 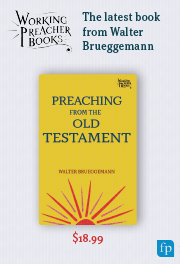 Perhaps you’ve already noticed a new series of Working Preacher articles, under the umbrella “Preaching + ___________,” which highlights when (in the Revised Common Lectionary), why and how preachers can do this kind of vital theological reflection on such issues. Once you’ve begun preaching about one of these challenges, you may also initiate a conversation on how your faith community can pro-actively assert its safety for someone who is struggling. Someone determined not to express the turmoil inside of themselves or in their household will stay silent unless it seems like people really want to understand or get into the midst of it with them. They might even, consciously or not, camouflage the situation by putting on the best show possible for church. After all, in some congregations, being at our “Sunday best” is expected. So many just stop coming. Negotiating what makes us different and being honest about how we are treated when we are different can be excruciating, but reduces isolation by exposure. Vulnerability creates space for genuine caring and meaningful relationships. Lectionary preaching that addresses issues deeply imbedded in our identities -- not only our theology -- helps all of us to see the Bible as relevant to our lives, and ourselves as valued within the Body of Christ. It is like unlocking and opening a door, through which people’s stories will flood in. Genuinely asking to learn could change the answers to those very questions. Lee Ann Machosky Pomrenke has served as a pastor in congregations in Virginia and Minnesota. She and her husband have two daughters and reside in the Twin Cities.